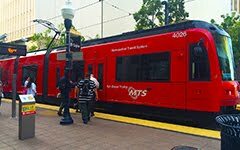 Southern California public transportation leaders push for federal funding | abc7.com: ""We are in a precarious position right now, because we do not know how much money we are getting from month-to-month, year-to-year," Johnson said. "When you buy buses or build transportation projects, you need to know that you're going to have a funding source that is stable and that you can rely on, so you can plan for those projects," Orange County Transportation Authority CEO Darrell Johnson said. "Starting and stopping is expensive to the taxpayer and it's not helpful to get the project out there.""